Pass a beggar on the road and one often hears “kuch kaam kyu nahi karte?”(why don’t you do some work?) routinely hurled at them. Ever wondered where do these people come from – unlettered, unskilled and devoid of any resources? Someone probably left home after floods hit his village or water scarcity killed his dreams of a good crop or the lack of resources drove his family occupation to closure. There’s little that attracts people to the cities.. Hell, even the air must be cleaner in villages..
People need very little to live their lives with dignity. When that little also becomes scare and difficult to get, that’s mostly when a person decides to take a plunge into the big cesspool of maha nagars or cities.. Its called migration.. This story takes a close look at how little things can turn this growing tide. It’s about what happened after the Bihar floods in 2008, but there’s nothing to say that disaster is a prerequisite for this to work.. Poverty is after all the biggest ongoing disaster for many. Floods are routine phenomena in Bihar as is migration but the 2008 floods came to parts which had never seen floods before so things were a bit different this time. Hundreds of villages fell in the path of a river which changed its course, rendering nearly three million people homeless. More than 300,000 houses were destroyed and at least 840,000 acres of crops damaged. Khursid Alam, a daily wage tailor (before floods ravaged his village Surjapur in Block- Pratapganj, District- Supaul, Bihar), stayed away from work confined to relief camps for months. He soon realized that there wasn’t much left for him. With no resources or support, the little work he earlier got from other tailors also came to a standstill..
Kripananda Sharma, a physically handicapped carpenter, made little income from his profession and from the shared agriculture on a small piece of land he owned. He got enough to support his two sons education at Purnea College. The Kosi floods submerged his land in tons of silt. His home collapsed and with it went his carpentry instruments. Kripananda went from being a Kaarigar (artisan) to a laborer. Munni Devi, had nothing left to loose after the floods. Struggling to feed her four children, Munni Devi desperately sought anything to do while waiting for her husband’s money order, (who had moved to Punjab after the floods). The desolation and the harsh reality of these people hits you hard… Would it be wrong if they thought of moving to a city for survival? And what do these people need to sustain their lives? Fact is even before the floods, income and livelihood for thousands was a question mark in Bihar. We decided to experiment with a new idea.. Vaapsi emerged thus.. Vaapsi meaning restoring back.. Goonj did a massive survey among the flood affected people to understand the needs; we asked the community members about their previous occupations and the resources they had lost and we asked about the aspirations of those who had dreams but could never take it up due to small critical gaps in resources. Through all of the data collected, we mapped out 35 traditional occupations for which we designed low investment occupational kits – right from labor to barbershop, Dhaba or Manihari to rickshaw puller and sewing machines. The occupational kits included the basic tools, clothing, and material required to get a fresh start. The unique repayment options for the recipients involved shram daan (voluntary labor) for their community. The rickshaw-wala’s new rickshaw would give free rides for kids to go to the community Chehak centers. 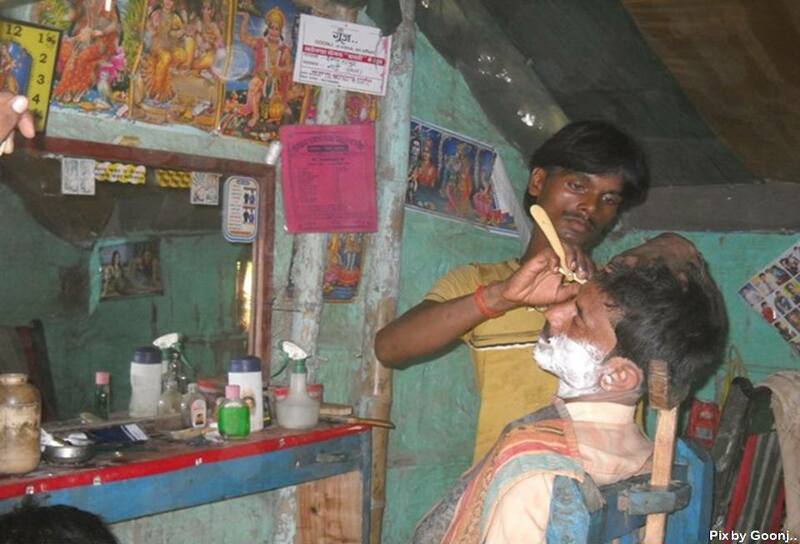 A barber would give haircuts to the kids at the village school. Thus in a simple revival of the old barter system people regained their livelihoods and paid back to their community. Vaapsi turned out to be an innovative solution that yielded a big impact. By other places he means Jaipur or Ludhiana. Khurshid doesn’t rule out going in future but says he is comfortable in his own village as he earns more. He is happy that he can now devote more time to his sons. Now Khurshid wants his sons to study as much as they want even if they decide to take up tailoring as their vocation. “It will make them a better businessman than I am and that is what I want – a better life for them.” Kripananda Sharma, the carpenter, was able to restart his work as a carpenter at his home. Now Kripananda’s family is heaving a sigh of relief, maintaining their life as usual. Goonj supported these communities with more than 20,000 such kits, worth 11.5 million (1.15 crore). About 70% (more than 14,000) of these were labour kits which included basic tools such as shovels & pails with some working oufits. We share this story in the hope that you will understand that it doesn’t take much to make a difference.. it’s the intention and the attention that counts. The story doesn’t end here…the next two stories will share how the silted agricultural land from the floods made us look for simple but innovative alternatives for the farmers and how drilling of some bore wells helped the farmers to produce other crops which needed less water.. Also in the later parts we will see how some hidden talents were discovered and even some serial entrepreneurs were born through the Vaapsi initiative and ultimately how the community came together to create Vaapsi Haats. A brand built around reusing and up-cycling even the last shreds of material that Goonj receives.